This impressive four-storey tenement consisting of flats above ground-floor shops was built as part of a municipal street-widening scheme. It was among the half-dozen most costly projects undertaken during Mackintosh's time with John Honeyman & Keppie / Honeyman, Keppie & Mackintosh. 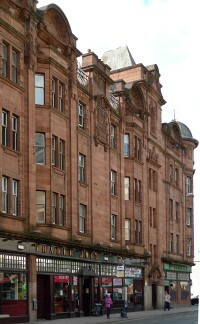 Old property at the N. end of Hope Street was acquired by Glasgow Corporation, demolished, and replaced with a new tenement set back from the former building line. The lively parapet hides a flat roof used for drying laundry, with wash-houses concealed behind the pediments and in the corner turret. The rich architectural treatment of the front elevation contrasts with the rear, where access to the flats is by hygienic open-air balconies of the type associated with improved working-class tenements. Authorship: 'Mr John Keppie, of Messrs Honeyman, Keppie & Mackintosh' was personally selected as architect by Glasgow Corporation's Subcommittee on the Improvement of Hope Street, and his appointment was confirmed by the Committee on Statute Labour. 1 Illustrations and a description of the tenement were published under his name in 1907, and it is arguably one of his most successful buildings. 2 Mackintosh's handwriting appears occasionally in the job-book entry, but there is no evidence that he contributed to the design. Alternative names: McConnell's Building, McConnel's Building. 1: Printed minutes of the Corporation of Glasgow, November 1905–April 1906, pp. 431–2, 437. 2: W. Shaw Sparrow, ed., Flats, Urban Houses and Cottage Homes, London: Hodder & Stoughton, 1907, pp. 69, 70.